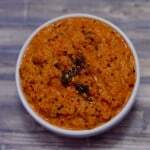 You may also like other chutney recipes like Methi seeds chutney,Red chilli Karindi. In a blender/mixer-grinder, add coconut,red chillies, ginger, roasted gram dal,tamarind,curry leaves and salt. Close the lid of the jar and blend them together using a little water at a time, until you get a smooth chutney of the desired consistency. In a small tadka pan.add oil, When it is slightly warm, add mustard seeds, hing and urad dal and fry until light golden, on a low flame. Pour the tempering over the prepared chutney. Mix well and serve the Red Coconut Chutney with dosa , idli. 1.If you have more coconut,you can skip adding roasted gram dal to this chutney. 2.I like adding few curry leaves while grinding gives unique taste and is more healthier. 3.You can also add some sambar onions/shallots to this chutney and is optional. 4.I have used bydagi red chilli for red color,also this variety is less spicy.you can increase or decrease according to your spice level.